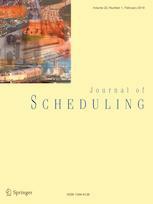 The Journal of Scheduling provides a global forum for the publication of all forms of scheduling research. It is the only peer reviewed journal with broad coverage of the techniques and applications of scheduling that spans several distinct disciplines. Readers facing complex scheduling problems can turn to the journal to find the latest advances in the field. Each issue features new and novel techniques, applications, theoretical issues, and innovative approaches to problems. The journal is designed to assist readers in computer science, discrete mathematics, operational research, engineering, management, artificial intelligence, construction, distribution, manufacturing, transportation, aerospace, and retail and service industries.